This is a new topic for us all to have a look at before and after pics, from nodule (or slab) to finished arrowhead/speartip. [img] [/img] And after, needs some pressure flaking around the edges. Nodule was from a field. Not a pic, but you get a before and after, and the middle stages too. And this is another random flint picked up from a field, nice colours but a bit hollow in the middle on this side, other side is convex. [img] [/img]And this is the beast after I've finished with it, the hollow left some colour in the middle, it was just under the cortex. Kind of looks like a flinty fried egg! [img] [/img]and this is the other side, I resorted to using a flat copper punch to get the notches this far in. Also a rare bit of afternoon sun too! very nice point, and a great bit of notching. do you display the points you make? Nice notching, how did you support it while notching? I've found the major problem with punch notching to be broken ears are very common. So far the points haven't made it in to a display case or something so sensible, as for support this was notched on the leg pad, on the leg! [img] [/img]Here is another field nodule. [img] [/img]Side two, it has a brown streak through the stone at the base which was a nice treat. more great pics - i wish we had flint in the fields here. Very nice work, I must remember to start taking some pictures of my next knapping. I'm gonna have to do a video on this. Pics are poor quality because of low light, did it this evening after work. Had a brainwave for the perfect thing to knap. Bottle bottom's are too curved, panes of glass too flat. Today at lunch time I visited a 40p shop, the local equivelant of a £1 shop and picked up those two magnifying glasses (2 for 40p). 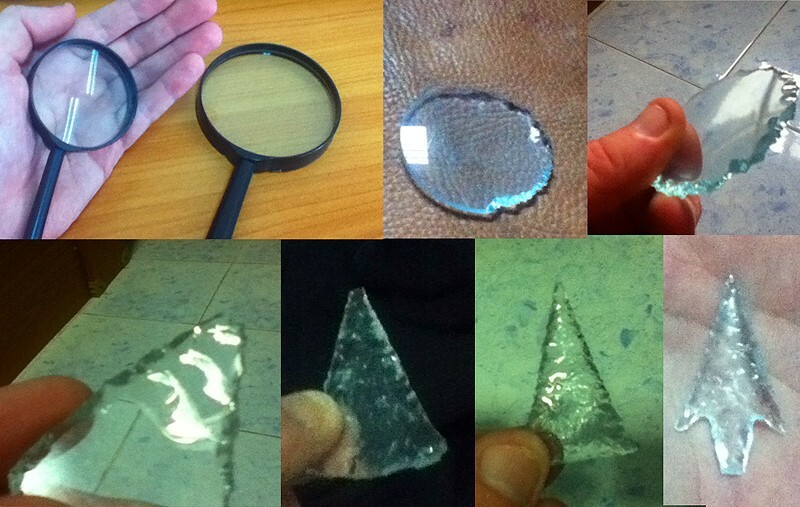 Very low quality, barely magnify at all, but make the perfect knapping glass. Perfectly convex on both sides, probably the easiest thing around to knap. Simply zigzagged the edge, sheered it into triangular shape, peeled off some flakes from the sides and notched it, all over in 20 mins. thats a great idea, will have to take a trip to the boot sale. excellent! looks like the flakes really fly across the surface!